Vice President Yemi Osinbajo has said that the return of peace in Benue is a proof that God answers prayers. 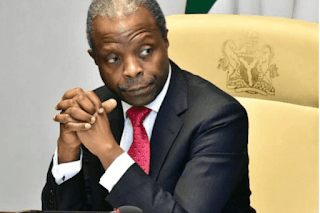 Osinbajo said this while addressing congregants at the 15th National Biennial Delegate Conference of the Pentecostal Fellowship of Nigeria (PFN) tagged `Benue-2019’ in Makurdi on Thursday. Mr Osinbajo, who started with a praise and worship song, acknowledged that it was God that spared his life in the recent helicopter crash. “It is a special pleasure to be here; I have a special reason to be grateful to God; I bring to you very warm greetings from President Muhammadu Buhari for a successful conference,” he said. “I have been here on three previous occasions, to sympathise with flood victims, to attend funeral of priests and thirdly to visit Internally Displaced Persons (IDPs) affected by the farmers/herders clash. "Today, because of your prayers, prayers of saints, PFN is gathered here in a peaceful Benue,” he said. According to Mr Osinbajo, it is righteousness that exalts a nation; hence the need for Christians to stand on the side of truth not that of corruption. PFN’s President, Felix Omobude, led the congregation on a special prayer session for Mr Osinbajo. Mr Omubude assured Mr Osinbajo that PFN would continue to pray for him. Cosmos Ilechukwu, the PFN National Vice-Chairman, South-East, said the fellowship had no fewer than 40 million members which he encouraged to exercise their franchise in the forthcoming election. He called on stakeholders to ensure that the elections are free and fair, while urging security agents to respect human lives. Gov. Samuel Ortom, chairman, Benue State Traditional Council, Tor Tiv, James Ayatse, were among dignitaries who attended the conference.